A 1920's cottage situated on a 15,000 sq. ft. lot, great for children, ONE HALF BLOCK from Lake Michigan. Charlie Chaplin stayed here in the 20"s when not filming in Chicago. 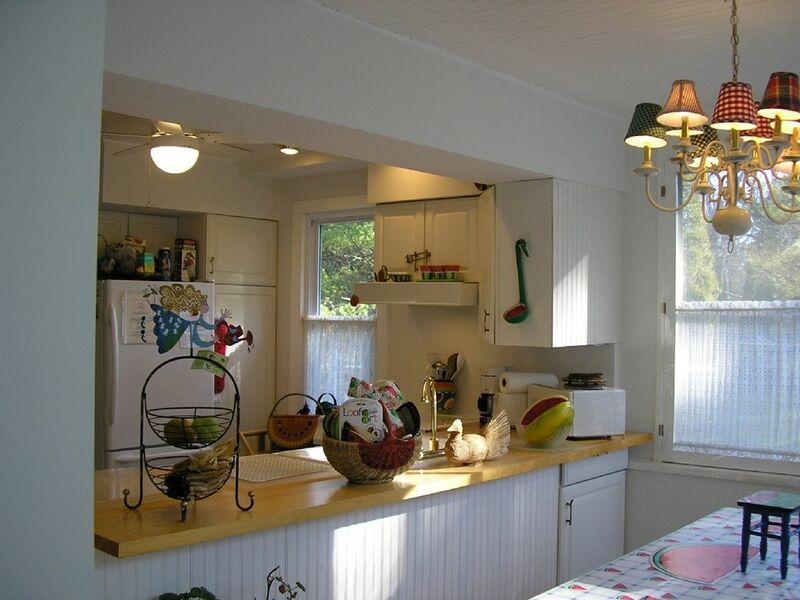 The two-bedroom cottage has a large kitchen, bath, living room and an enclosed porch. The blue bedroom has two twin beds, and the white bedroom has a full size bed. There is a full-size sofa-bed in the living room, along with a TV, CABLE, WIFI. The cottage has everything you need, only bring you bathing suit and boom box. All linens for bed and bath are provided, hair dryer and hand soaps in bathroom. The PATIO is equipped with a large grill, table, umbrella and chairs and a FIRE PIT & LOGS. Build a fire and count the many stars above Union Pier or take a romantic stroll along the sandy beach. Excellent location!! Beach was gorgeous!! Sharon was great to work with!! Me, my wife, and our 5 year daughter enjoyed our time here very much. Quick, short walk to the beach, and a short drive to restaurants and other things to do. We really enjoyed our time in Union Pier (as we do every year!). The cottage was perfect! Clean and accommodating. Sharon was quick to answer any questions we had. We would definitely rent this place again! Thanks Sharon! The house is located an easy walk to the beach and bakery. The yard is large and a very quiet neighborhood. We had a wonderful time! We enjoyed our stay, the beach is very close (and easily walkable) that we were able to walk down most evenings to see the sunset, even after spending the day on beach. Nice to have a dedicated parking space at cottage as well. Union Pier is in the "middle" of everything, easy to do quick trips to Farmers Market in New Buffalo, Sawyer, Cherry Beach, Three Oaks, all within 10 minutes. Cottage was very nice, clean and super close to the beach. We traveled with 2 small children and being that close to the beach was amazing. Would love having them back.